That last blog entry was a lot of writing, so I’ll try to keep this mostly images. 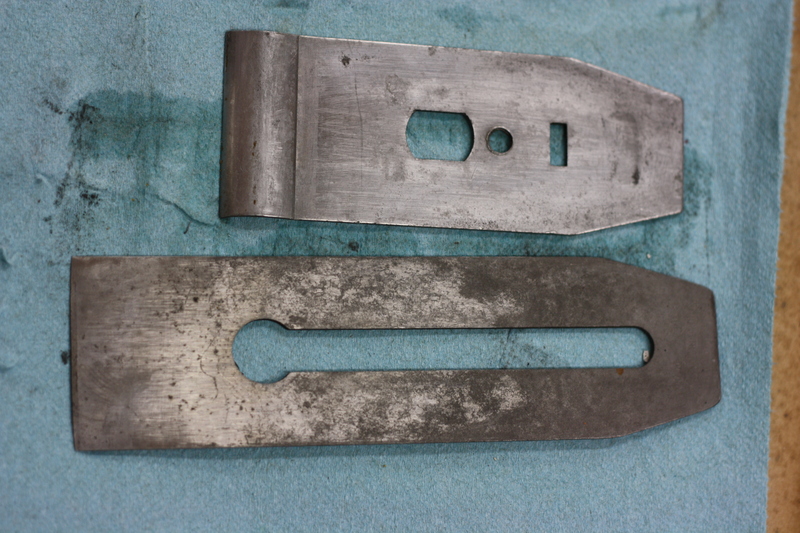 Blade and cap iron after soaking in Evaporust for 6 hours… I’ll finish cleaning them up later. Oh. My. Goodness. I can tell you now why I’ll never collect or pick up another Type 4 Millers Fall handplane. That orange varnish is horrible. I thought about trying to just leave it, but if you’ll notice in the pre-restoration detailed image, there is a distinct line across the tote near the base. Or maybe you won’t; it’s kind of a crappy picture. In any case, I think it is a break. It didn’t look like it went all the way through, but I needed to examine it more closely to see what needed to be done about it. That meant removing the varnish. Not knowing exactly what it was they used, I first tried lacquer thinner and denatured alcohol, to no effect. I didn’t really think it would work, but… one has to hope, right? I thought I had some green paint stripper laying around. Apparently I didn’t. 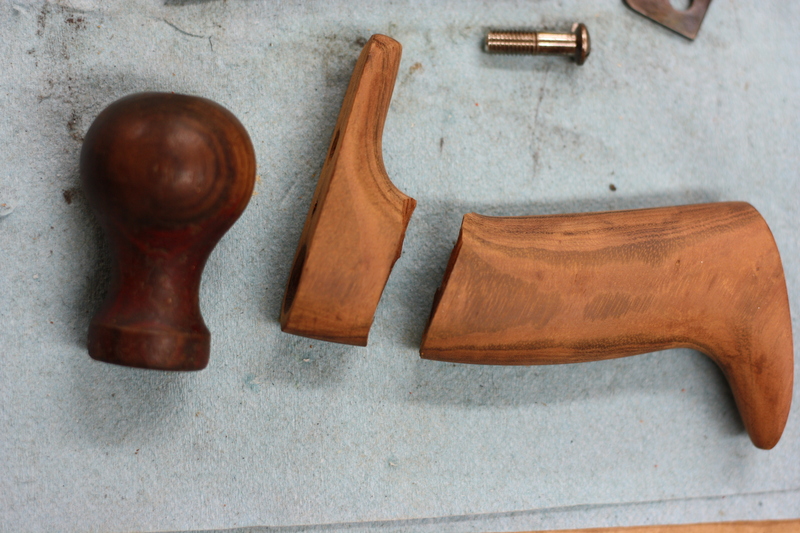 That meant removing the tacky (as in tasteless, not sticky) orange varnish the hard way – scraping and sanding. When it comes to removing orange varnish, “MF” has a whole other meaning. But I finally prevailed. Because I didn’t have much time left in the evening, and I didn’t have any weird angled jigs for gluing up totes, I decided to go with Titebond Hide Glue, holding it in place myself until the glue set. 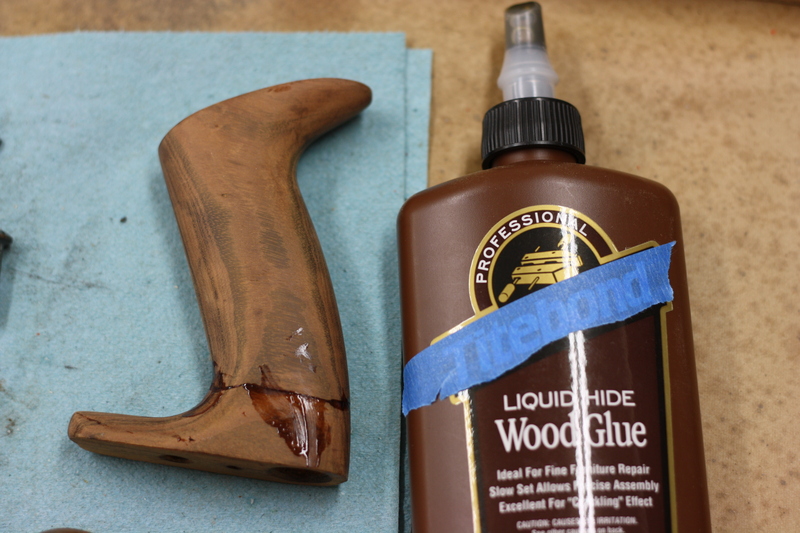 I’ll scrape off any residual glue before I put a few light coats of shellac on the tote. I decided to do something easy before quitting for the night, so I tackled the small bits. After soaking for a few hours in mineral spirits, the small screws and bits cleaned up rather easily. I use a Dremel with a small wire wheel on it to clean crud out of threads and such. I noticed the metal tab that holds the frog adjusting screw was originally blued, so, being the bluing expert that I am, I decided to re-blue it! 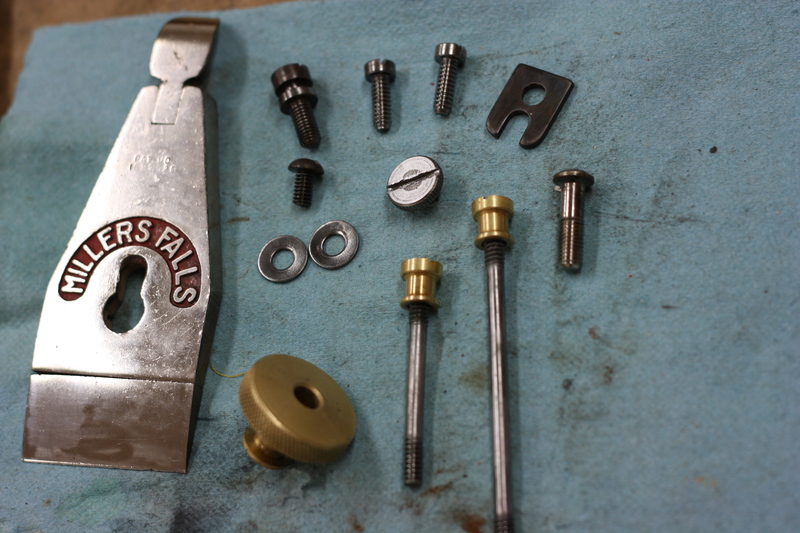 I’m not yet happy with the final polish on the lever cap, so I’m going to give that one more round of polishing. It’s all going very well and I look forward to the finished item. 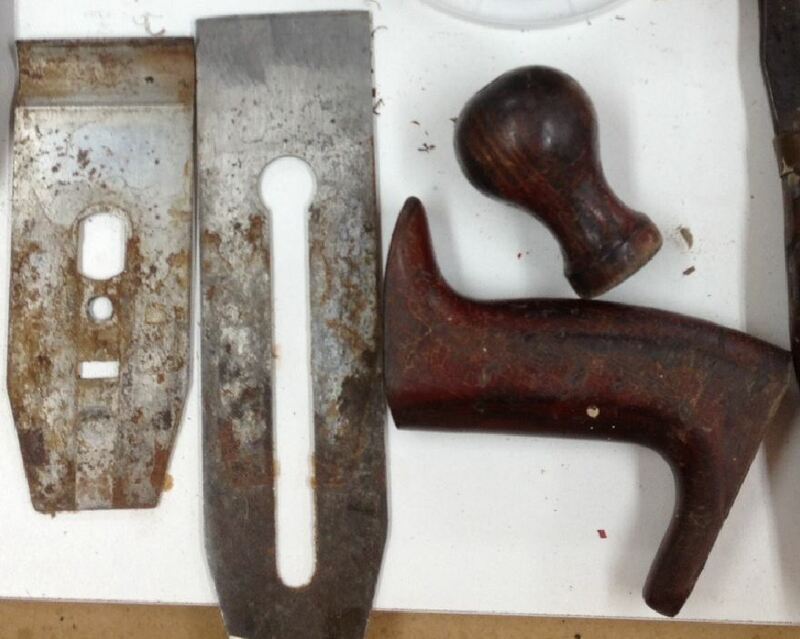 I’ve been slowly but surely restoring a Stanley type 11 jointer. I have it working just fine, now I’m trying to get it to look really pretty. I found myself using wd40 and brasso. 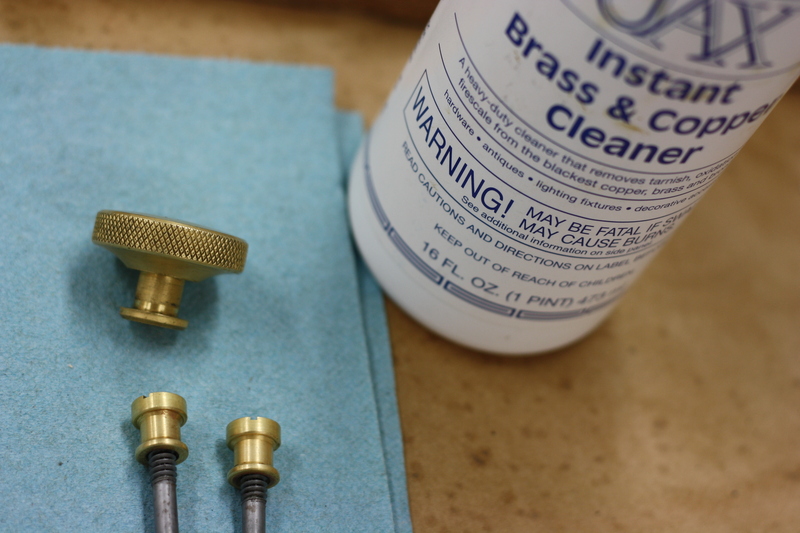 The wd40 worked okay, the brasso did a nice job with the polishing. Seeing what you are going through with the tote I feel your pain. My tote is intact, but I’ve tried everything to strip it without a whole lot of luck. I may have to go your route, sandpaper and a razor. Good luck! And just so you don’t feel bad, I’m having all kinds of problems uploading photos on wordpress as well. It’s at the point where I only put up a few because it’s such a hassle. 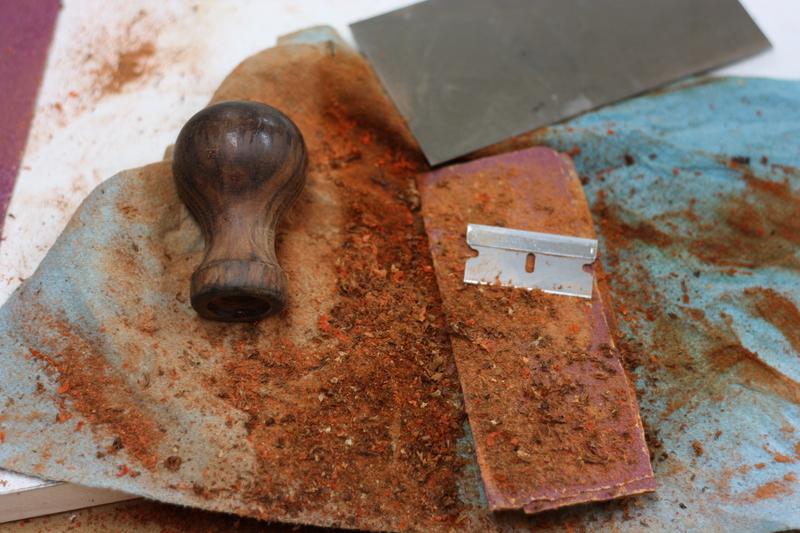 The razor did OK in a few tight places, but I mostly used a heavy card scraper (the grey rectangle behind the razor in the picture) with an aggressive hook on it. That worked much better and faster. For the photos, I just decided to enlarge them to full width. Looks better that way, I think. his attention to the wooden is little wonder …. Why hide the Titebond name. There are what, only two brands available? That was pure sarcasm right there. You shouldn’t take most things I do very seriously.